Javier Agüera (Business Award), Edgar Vinyals (Social Award), Guadalupe Sabio (Science and Academic Award), Leticia Moreno (Arts and Literature Award) and the Marianao Private Foundation (Organisation Award)are the winners of the IMPULSA 2012 Awards. 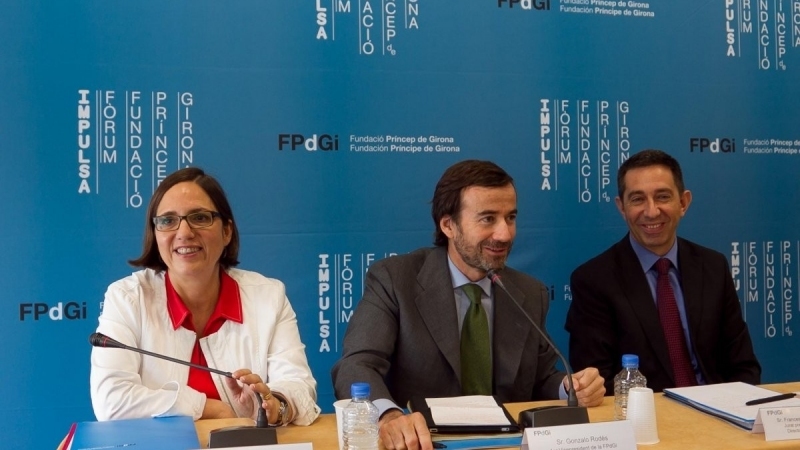 The Prince of Girona Foundation (PGiF) has today announced the winners of the IMPULSA 2012 Awards, which recognise young entrepreneurs and innovators - aged between 16 and 35 years old - who have the ability to take risks and the motivation necessary to bring about changes in society. The IMPULSA Awards are designed to promote and foster initiative and effort, research and creativity, solidarity and the development of talent in young people who are keen to build a fairer world in a globalised environment. The main selection criteria for granting the Awards focus on exemplariness, distinction, visibility and impact, among other aspects. With a prize consisting of €10,000 and a reproduction of a piece by the sculptor Juan Muñoz, the IMPULSA Awards will be presented on 29 June at the Girona Auditorium during the closing ceremony of the IMPULSA Forum 2012, which will be hosted by Their Royal Highnesses the Prince and Princess of Asturias and of Girona. Javier Agüera (Madrid, 1992), principal promoter of the company GeeksPhone, for clearly representing the three values the Awards seek to recognise: youth, innovation and business leadership, as well as international reach. Edgar Vinyals Rojas (Barcelona, 1985), founder of the Inclusive Leisure Association Saräu, for his capacity for personal improvement and for promoting a responsible project for people suffering from mental illness. Guadalupe Sabio (Badajoz, 1977), medical researcher, for her scientific excellence and international leadership, as well as for the social interest in her line of research and the interdisciplinary nature of her work. Leticia Moreno (Madrid, 1985), violinist, was chosen by the Jury for her technical precision, her powerful performance and her future as an artist, and it has even decided to sponsor her career. Marianao Private Foundation, from Sant Boi de Llobregat, for its long history and close connection with its area of activity, for its comprehensive work with young people with special emphasis on disadvantaged groups and for strengthening social and occupational inclusion and carrying out its work with a clear community approach.